There are 3 basic models of Airchief car radio’s that suit the FX & FJ Holden’s. 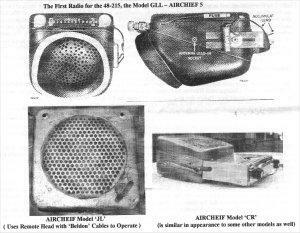 All of the Airchief series of radio were manufactured by Electronic Industries, a division of ASTOR. The very same radio’s were therefore also branded and sold as ASTOR’s. For the purposes of us old Holden restorers we’ll refer to all the car radio’s listed here as Airchief’s. By model they are the GLL, JL & the CR. By far the most popular of these is the model CR which is still relatively available though usually in very poor condition and requiring considerable effort to restore them to their former glory. This is a five valve superheterodyne radio utilising the larger variety of valves known as Octals, so called because of their 8 pm base. It was the first radio specifically manufactured for the FX and as such is a self contained unit, complete with it’s own speaker and fits neatly up under the dash. Performance wise the radio gives a good account of itself as do in fact all the Airchief models. The model JL is what I like to call the ugly duckling of all the Airchief radio’s! This radio utilises 6 valves, is also a superheterodyne and like the model GLL uses Octal based valves, though later varieties used a mixture of both octal’s and miniature types. The Model JL is an excellent performing radio and has a nice rich tone which emanates from it’s built in 8 inch (200nun) speaker. The ‘ugly duckling’ claim comes from the fact that this radio is large at approximately 9 inches (225mm) square and is operated by two drive cables that go from the radio and curve up to a remote control unit that is fitted into the usual spot in the dash panel. From the dash the radio appears as any other but the rather bulky radio itself has to mounted onto the firewall and is fairly visible. Also two holes have to be drilled through the firewall to support the radio and as such it’s certainly not a favorite choice with car restorers. 1 have also come across a model of this radio that had a bakelite remote control head that mounted up under the dash, just below the speaker grille. It was obviously made as a generic fit for any type of car but the radio was 6 volt and the previous owner assured me it was in his FJ Holden. The model CR is a 6 valve superheterodyne radio that utilises both 7 & 9 pin miniature type valves. It is a very compact unit but requires an external speaker, having none built in. The radio is an excellent performer and judging by it’s availability now would have been the most popular of all the Airchief s of that era. Having the miniature tubes made the radio a very compact unit and as such easily fitted into the tight confines behind the dash. Only one hole is required through the firewall to support the rear of the radio and access to the connections for the speaker and antenna are good. The radio also has a tone control, there was none available on the model GLL. An appropriately shaped aluminum panel was supplied to support the 5 inch (125min) speaker behind the speaker grille of the FX & F1 The speaker gave an excellent volume level and a good tone. The radio’s were easy to service and from all accounts they were a reliable unit. The model CR is possibly the best choice if your looking for a radio for your FX or F1 This is because there are still a few kicking about and they are easily repaired by a suitably qualified person. There is also a Model GM which is similar to the CR but has one less RF stage and no Tone Control. There were many other radio manufacturers that produced car radio’s and made ‘adaptors’ so that they could fit into the FX & FJ Holden. AWA (Amalgamated Wireless Australasia) produced one designated a Model 3Z, it used miniature tubes but had a rather plain looking facia. Philips; also produced a model to suit the FX & FJ. Finding and Restoring an Airchief Car radio. Where to find a suitable radio for your car? A bit like a needle in a hay stack! But they are out there. 1 have got most of my stock from radio collectors who put little value on an ‘old’ car radio. Second to this try the swap meets and garage sales. What to look for? Condition and Price are the main candidates here! If your looking for a mint working example forget it there’s none out there. Almost all of the radio’s have been languishing in a shed somewhere and as we know shed’s leak water, are full of dust, rats and mice who love to munch on the old wax & paper capacitors in them. Your radio when you find it is going to need overhauling at the least so don’t worry about whether the radio works or not or is full of mouse dung. Most important things with regards it’s condition are it’s completeness. Does the radio have both the knobs? Also the tone control knob if applicable it’s a horizontal black serrated edged dish located just above the station dial scale. Are they the correct knobs? They should be round in shape, black with a serrated edge all the way around and have a chrome disk in the middle. Some early models used white knobs but they looked the same. Quite often the chrome disk has fallen out. Does the radio have the chrome face plate these are almost impossible to get, If you own an FX your in luck because it’s that same chrome plate in your dash panel you just remove the white plastic strip and use the chrome plate for your radio, Is the clear plastic dial window intact? most of these are now either missing or broken beyond repair, if it is still intact it’s probably gone yellow with age, Is the station dial scale still there and if so is it readable? The rule of thumb here is no different to anything else the value of something is whatever you’re prepared to pay. As price is usually the most important point for most people here are some guidelines my opinion only! If the radio is in good condition and complete to the last detail be prepared to pay for it. My own upper limit for a good FX/FJ radio is about $100.00 but it would have to be in complete condition. Prices asked at swap meets are usually too high but quite often a bargain comes along. 1 have found that very few are advertised in the papers. 1 looked at one recently showing signs of rust from being wet and missing the dial window and station dial scale price? $150.00, a later check had the figure at $100 and again later at $90.0W 1 offered $50.00 but was refused. 1 went back later and it had been sold, so someone has some work cut out for them at a premium starting price. The dearest I have seen one in unrestored condition was $280.00 it’s probably still there! 1 recently purchased a model ‘SR’ which is an up market ‘Auto Tune’ version of the model ‘CR’ but it was complete in every way. 1 spent two whole days repairing the Auto Tune part of the radio alone. This had failed years ago and had been disconnected. Had you purchased it and not had the knowledge to restore the radio you would have faced an enormous repair bill. Fully restored Airchief s are available from commercial suppliers, 1 believe a reputable Co. in Melbourne sell them for approximately $500.00, fully guaranteed. Just be careful, there are many ‘shonky’ back yard repairers about so don’t jump in too quick ask about and see if there’s any bad feedback from a past customer. if the supplier can’t supply a reference or a guarantee for his work then he’s probably not worth dealing with. Remember, if you pay top dollar for a radio and then have to pay someone else to repair/restore it for you then you could end up way out of pocket, even more so if the work is not correctly performed. Today, fifty odd years down the track, the radio’s are still relatively, easy to work on, electronic parts and valves are relatively cheap but age has taken it’s toll on some of the mechanical aspects of the radio. A few of the problems encountered are the small tuning drive ‘gearboxes’ are often seized and have stripped gears. A flexible drive coupling used is made of rubber and is almost always perished, valves sockets are quite often rusted and require replacement the on/off switch/volume is often broken and correct replacements are no longer available, vibrators, even new ones, often have burnt or corroded contacts. If you have (or want) an Airchief car radio then feel free to contact me if you need it restored, 1 also have available reproduction dial scales and dial windows. If you have a 12 volt system and would still like an original radio then that is no problem either. I can adapt a later transistorized radio to an FX FJ front so that you can have the convenience of a modern radio with the looks of an original.